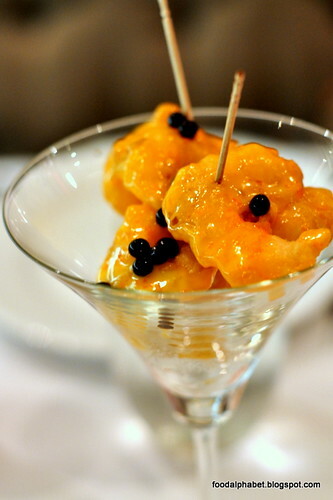 Rock Shrimp popcorn (P325), probably the most famous, most delectable and most ordered appetizer of Krave Restobar, 6 pcs. tempura rock shrimp, with wasabe mayo and spicy mango sauce. 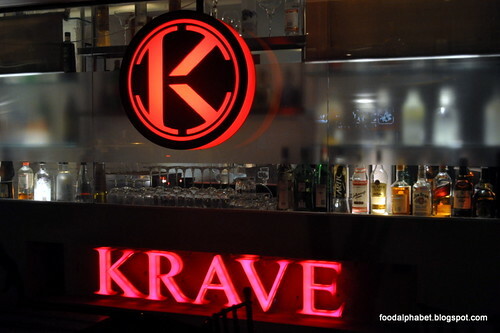 If this is the first time you're dining in at Krave, then I believe this is a must-order. Get to taste the crisp-fried tempura battered shrimp, twist it with hint a spice and kick from the the wasabe mayo, finishing the bite with sweet spicy mango taste, a wealth of flavors that is to be shared, or better yet enjoyed alone, cause you would want more. 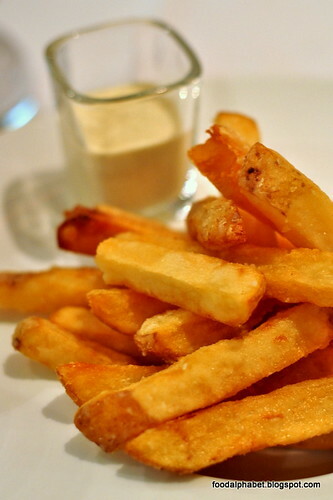 Truffle fries (P275), hand-cut fries, deep fried crispy wonders dipped in peppermill dressing, is as tempting as it gets. 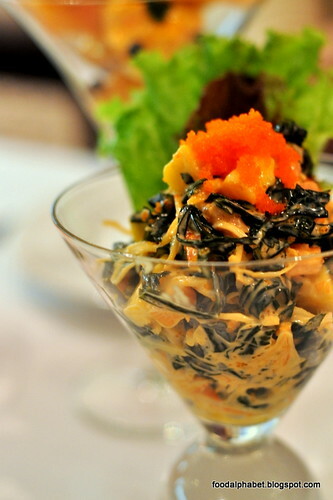 Savor their delightful salad creations, such as the Wakame Salmon salad (P245), a mix of salmon, seaweeds, and a generous serving of salmon roe. 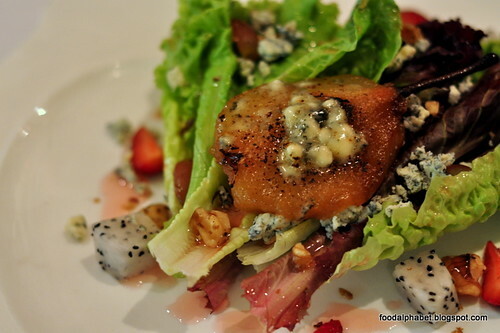 Pear Salad with Walnut and Bleu Cheese (P285), a refreshing treat for the senses. Served with mixed berries vinaigrette, the pear gave a sweet caramelized flavor that made the salad more teasing with fresh fruits and fresh vegetables, makes a healthy and delicious salad. 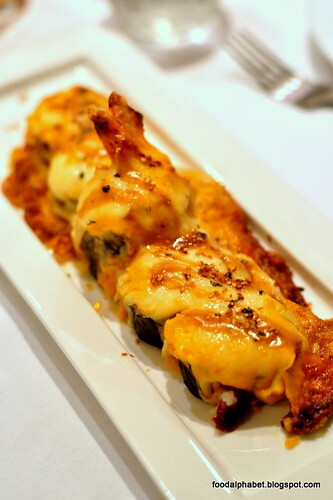 Lava Roll (P385), named because of how it looks, it somehow is right? Take a bite at this maki roll creation that is truly Krave. Other specialties of the house include pictured on the left, the Rack of Lamb (P795), 3 pieces rack, slow-cooked and grilled to perfection with Rossini rice is soft to the bite, tender and tasty as Jane has always wanted for her lamb and pictured on the right is Dinosaur BBQ beef ribs (P685), with Apricot-Cranberry BBQ sauce. 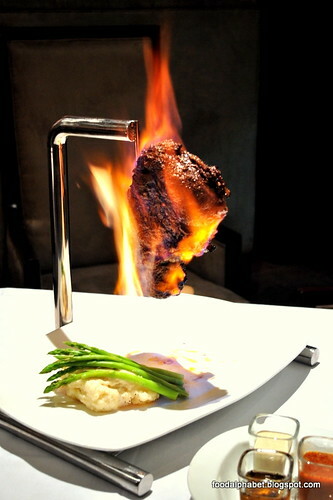 And the highlight of the night, Angus Pinwheel steak (P3,495), this 25oz. 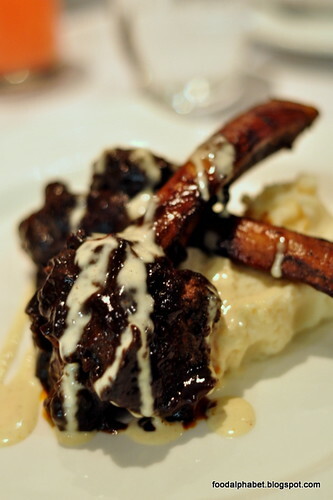 USDA Prime Rib-Eye, served with side salad and twiced baked sweet potato, with Gorgonzola cream and Burgundy wine sauce is a trademark dish of Krave. 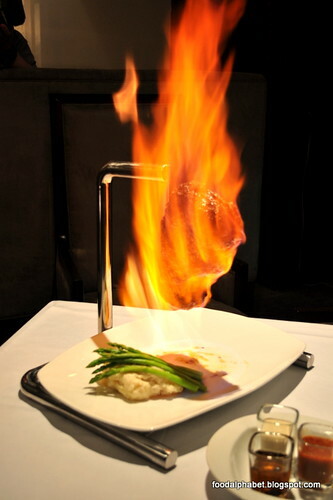 Enjoying this dish starts with the sight of the rib-eye cooked and drowned in flames at your midst, and slowly with every slice, you know that only the best meats are served here at Krave. 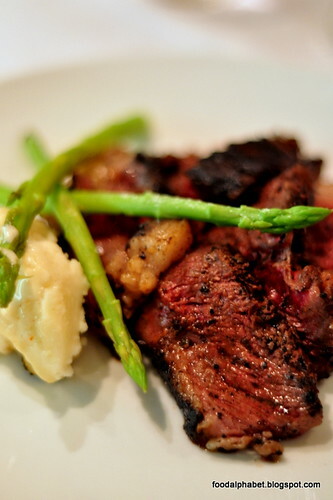 Sliced and served, this sumptuous steak is definitely for sharing. 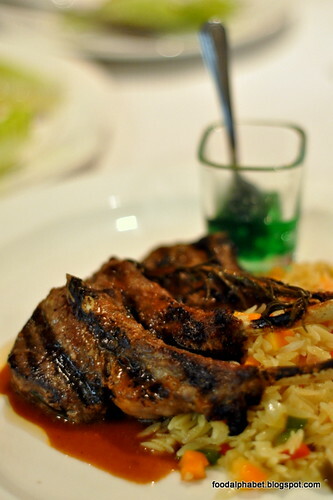 Each bite into that soft, mouth-watering piece of succulent red meat, makes me forget my worries, and just let taste buds enjoy every bit of this divine moment. 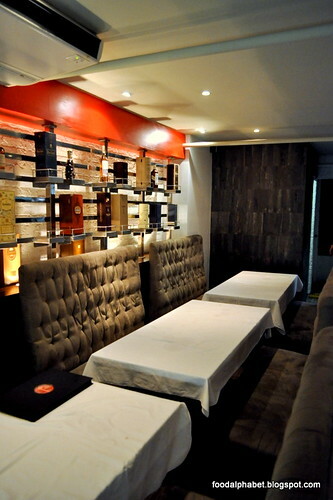 Krave Restobar, is more than what you can expect, from a great atmosphere, to soulful interiors and great tasting food. 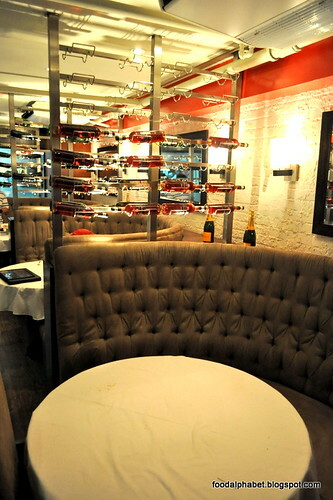 People who dine are left in awe and satisfaction in every sense of the word.